Varsity Blues swimmers competed against Britain’s Loughborough University in November – but neither team left their home country. “It was both exciting and stressful, since racing an opponent who isn’t there shifts the pressure to racing the clock and hoping for the best,” says men’s Blues co-captain Mitchel Ferraro. Plans are now in the works to turn the virtual meet into a physical meet, with Loughborough hosting the Blues this fall. 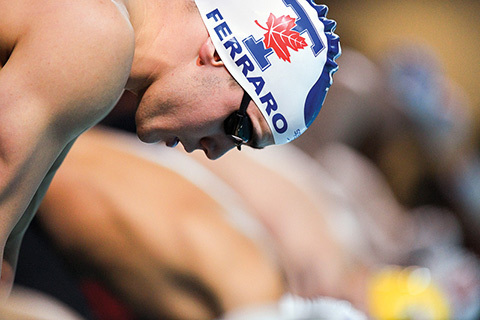 “It’ll be a thrilling opportunity to race the people behind the virtual times,” says Ferraro.